"Help me, Obi-wan Kenobi. You're my only hope." Is that the voice of a rebellious princess, in need of someone to help her finish a harrowing mission of galactic espionage? Or, is it your little princess, in need of a diaper change? Either way, it sounds important, so you better get on that. If you have a budding Star Wars fan wanting to get dressed up with the rest of the family, this Princess Leia Toddler Costume is the costume you're looking for. What better character for them to start their Star Wars education with, than the rebel leader who triggered the events that brought the rest of the heroes of the Rebellion together? The best way to get into anything is to start at the very beginning, so this soft white robe is designed to look just like the robes Princess Leia wore in the original Star Wars film. Of course, no Leia costume would be complete without her trademark "cinnamon bun" hairstyle, which is adorably recreated with the included headpiece. 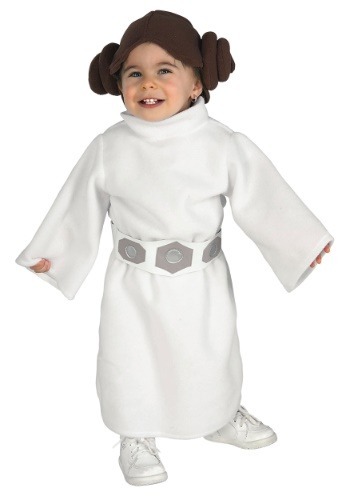 When your little one is wearing this costume, she'll be causing trouble for the Empire before you know it!